We'll see if this in fact becomes a weekly installment. I'm hoping it will, but I'm not always the most consistent blogger. Even before we had Jack, I was always on the look out for quick and easy meals. So I'd like to share some with all of you in hopes that you'll share some with me. Make a post with one of your favorite Quick and Easy Meals and link up below. Then visit your fellow bloggers and check out their recipes! Here's mine. I got it from the KraftFoods recipe iPhone app. I used to get their Food and Family magazine every season, but recently they started charging for it, so now I just browse the website every once in awhile. We tried this tasty recipe for dinner a few weeks ago and again last night for dinner. 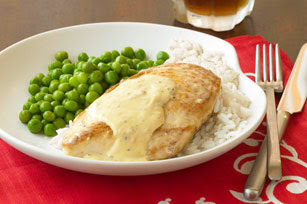 It beat out my old Honey Mustard Chicken recipe because it has way more flavor and takes half the time! HEAT oil in large nonstick skillet on medium heat. Add chicken; cover. Cook 5 to 6 min. on each side or until chicken is cooked through (165°F). MIX remaining ingredients; spoon over chicken. COOK 2 min. or until sauce is heated through, stirring occasionally. Calories: 270 For the rest of the nutritional information go here. Add some rice or mashed potatoes and some veggies and you have a healthy, tasty meal on the table in 25 minutes! So add your recipes here! I can't wait to check them all out! Thanks for the follow I am returning the favor, looking forward to seeing your recipe shares! Oh that looks good! Makes me wish I had chicken for tonight! I don't have anything to linkup this week but if you make a button I will add it to my list. great idea for a linkup. Thanks for linking up to Mom Blog Monday Blog Hop! Hope to see you again next Monday :) I am now following you back! P.S. Did you enter my diamondearrings.org giveaway? It has extremly LOW entries and ends 9/18. I am your newest follower. I hope you can follow me back at http://mylifeadventurebyme.blogspot.com/. That looks good! I'm going to browse my blog for a good recipe to link up! Thanks for visiting my blog, I have a blog hop on Wednesday, Friendly Wednesday, hope to see you there! Ooo! Looks so good! Following back! Thanks for coming by!